The Black Legion Karambit Pocket knife was inspired by the karambit design including the signature open circle handle. 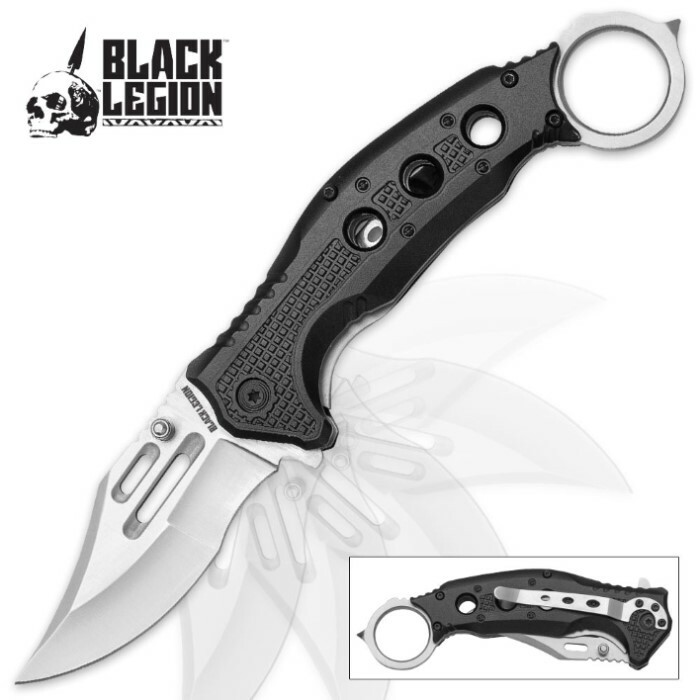 It features a 3” 3Cr13 steel blade with a satin finish and opens smoothly and quickly with a spring assisted mechanism and thumb stud. The handle is of aluminum and the knife has a satin finish liner. There is also a pocket clip so that you can carry everywhere. It is 5 1/4” closed. I have approximately 50 or more knives, all different styles and this is definitely my favorite! 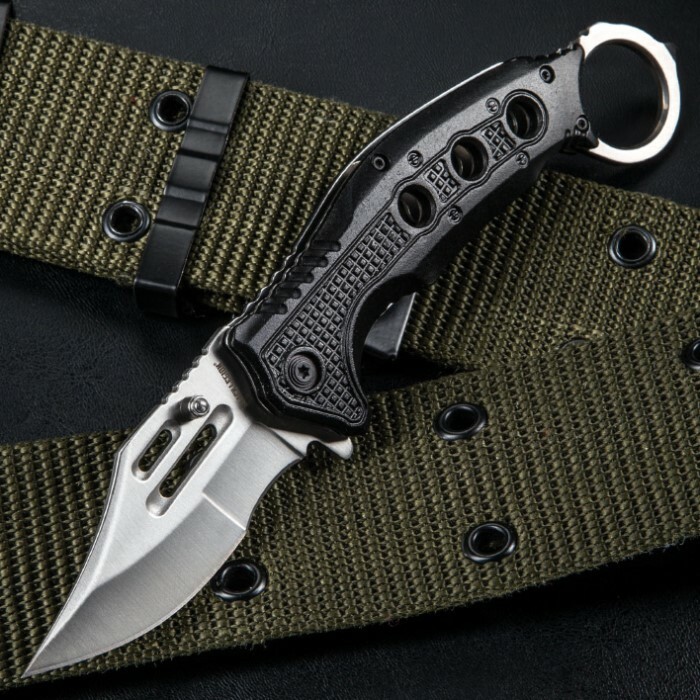 The price is unbelievable for this knife! Honestly they could charge 25-30 for this knife and I would pay it! It is extremely sharp, well built and solid! It snaps open in a flash and locks in tight! I absolutely love this knife! I normally prefer fixed blade to flip but this amazing! I will probably buy another one! This is a amazing buy! This knife came extremely fast and I am so glad that it did. It has a rock solid lock up, no blade play, very snappy opening , is nice and sharp and much bigger than expected. I'm glad I ordered two! The blade is more of a bowie style blade and I love it. Is it a kerambit? 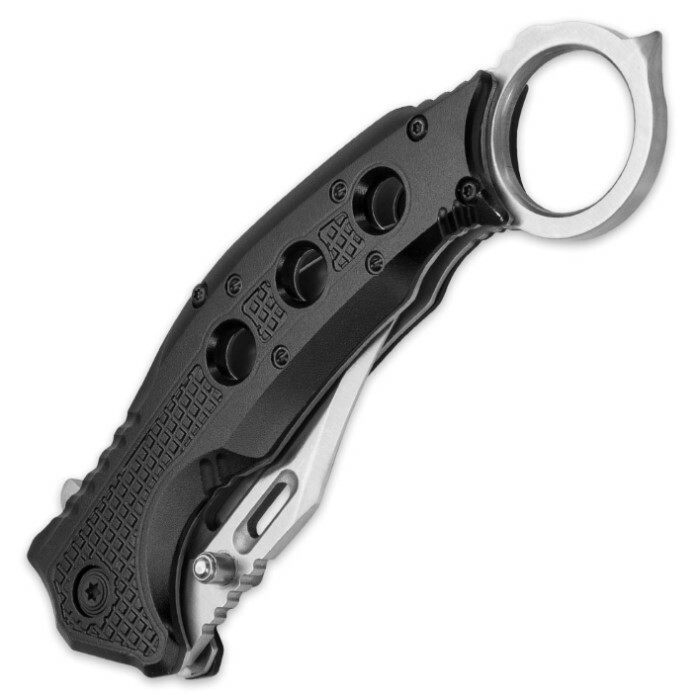 Well, no not a traditional one but what a great piece for any kerambit fan. The best part is the price, 7.99!!! This knife is easily worth twice that. I will probably order another two just so I can give them as gifts! All in all very happy with this purchase.